Well since we're starting 2014, I'd like to look back on the games of 2013 that surprised me, and more importantly what these games do that we're likely to see more of in the future. Of course I'd like to involve TAY readers to share their own thoughts. This can range from the new IP, the obscure indie, the game that changed your perception on a genre, a sequel making an odd shift...and how that game could effect other titles or the industry in the future. Your choices don't even need to be good games, they can be bad, funny, or all of the above. In the last month or so, while I was coming up with my top 2013 games, I noticed that my list kept rearranging as I played through more of these experiences. When I played more of Don't Starve, I realized two things about rogue-likes and me. I end up playing them in random bursts, and each longer run I last through leaves a more favorable impression. Don't Starve wasn't on my top 10, until just a few weeks ago when I had an amazingly tense session that is still going since I saved. Getting further and progressing revealed more weapons, items, and finally me establishing my own kind of base of operations. The free-form nature of the randomized world, mixed with me putting my own kind of organization into it was an odd sensation, as most games treat us like nomads hopping from one level to the next. The base focus I saw out of this game though, and many this year was on the aspect of survival. We've all seen the big games this year and last, with the Walking Deads, The Last of Us and Tomb Raider. While they focus more on scripting a survival situation through their fairly non-interactive cutscenes vs. their gameplay, one cannot deny they're still fairly effective, and people want this stuff. 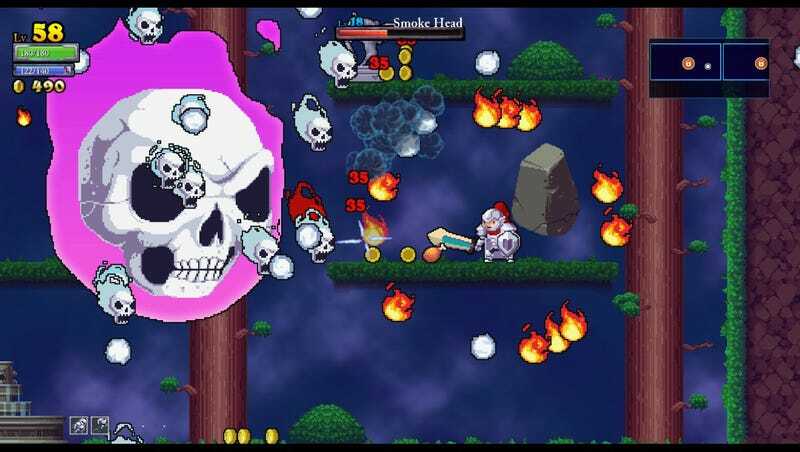 Rogue Legacy fits in an interesting place, where it focuses on survival through mechanics like perma-death, but eases the loss through lineage and RPG progression. You carry enough back from your last run to keep justify hurting yourself in the future, not unlike Dark Souls with its chance to regain souls. However, unlike Dark Souls I legitimately had issues early on beating just the first boss. This was new for me, because I regularly play games at their highest difficulty, and it really frustrated me why I couldn't push past it at first. I think it was the 2d platformer focus that did it. While I grew up with Mario and Sonic, they weren't what got me into games. It was isometric RTSs and RPGs, along with 3d shooters, stealth and immersive sims that got me into games...so my skills for judging game space precisely in 2d wasn't that up to par like a longtime Nintendo fan. After beating that boss though, that wall shattered, and the satisfaction I got from them was pretty immensely strong in the same way imagine Dark Souls is for its fans. We are only seeing more games toy with difficulty, and making it feel more manageable, while at the same time keeping that harsh experience. It makes sense too, considering how being on the edge of your seat before losing a life was part of games so long ago, but now seek to make that experience more meaningful, if not the core of why we play. What wasn't my favorite experience this year was Sim City…except it kind of was for a while. Yes, Sim City wasn't a surprise for me just of all the DRM/server issues, but because it was a great game experience for a while. See I live in the Silicon Valley, so that first day or so I actually was able to connect to the game and play, even before they removed cheetah speed. Before I played, I watched the livestream from IGN during a rather dull day of work that lasted for around 6 or so hours, and the game looked great. Booting it up myself, I felt the same as I was greeted with the gorgeous almost dollhouse visuals, and absolutely stellar music that completely hit my nostalgia of getting into PC gaming. The interface was clean, messing with curved roads was freeing, it streamlined my absolute least favorite aspect of the previous games with laying down water pipes, and I loved how everything was visualized to make the experience clearer. However, once you start to hit the borders of your city, and have to maintain it…all of that came crashing down. Bugs started to creep as my town filled up, with pollution and garbage not working correctly, and my sims asking for endless amounts of residential area. I lamented that lack of subway options to maintain traffic, that curved roads used that limited space inefficiently, and that I couldn't mess with disasters since I can't make multiple saves. People may give reviewers crap for rating this game high, but that's because for a portion of time about as long as a AAA action game campaign…this game IS fun. What's worse, is that if they'd just sacrifice some fidelity, and open up that city size, they could reclaim so much ground, more so than putting out that futuristic expansion. It was an experience front-loaded with fun, ending up tricking reviewers (not unlike Total War: Rome 2), and I suspect it won't be the last. It was also another nail in the coffin for games that take single-player experiences, and force online infrastructure on them...clearly a trend gamers want to see dead. 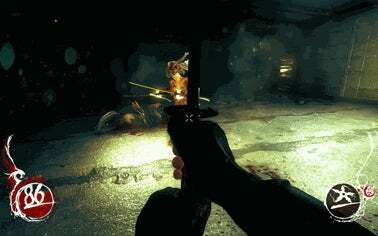 Taking nostalgia the opposite way, I had the pleasure of playing Shadow Warrior this year. It was a remake to a shooter back in the days of when I first loved them: the late 90s. Oh how 90s it was too, forgoing the hyper-serious grit, slow movement, heavy scripting, and reliance on cover with regen health…all things I am starting to dislike in modern shooters. It wasn't just surprising how much I enjoyed all that crap not being there, but how much I liked the older school focus on dodging and generally higher speed, the slightly garish overly saturated art, the over the top weapons with no loadout limitations, and just being built entirely around a keyboard/mouse first vs. a controller. Within a few short hours, a mix of old and new school design, plus one weapon, provided me the most visceral experience I've had this whole year. Even the story decided to be interesting, all in some attempt I felt just designed to mess with me, and fight for my GOTY. If XCOM and Dishonored hadn't continued with their expanded content, it likely would've been, and that still amazes me. All of these top 3 games have one thing in common though: they're all re-imaginings of old school design, mixed with new sensibilities, and it's a powerful combination. This trend of mixing old school design philosophy and new school innovation isn't some temporary thing...it's arguably what I see defined in the indie market itself, and thankfully looks to only be growing. What I do love about older games is I feel they put more attention on the player, and asked alot of us, rather than just wanting to lock us in for the roller-coaster ride. A lot of talk in 2013 was surrounding Kickstarter, crowdfunding, Steam early access, and just the concept of playing unfinished games. Out of that process, the audience is able to play games earlier than ever before, and get each new major build up until release. What actually sold me on the concept though wasn't an indie game going through this process, but rather Blizzard. My experience through the beta of Hearthstone surprised me, because while the game is clearly not done, I had more fun with it than many supposed finished and polished products. For the first time too, a collectible card game finally transitioned into an interface that didn't feel clunky and boring for a video game. Card Hunter and Scrolls look to also open up CCGs in video games. There was solid visual and audio feedback for everything you performed, and a fairly quick pace to play. As someone familiar with Magic the Gathering, I expected a lengthy dull tutorial, but Hearthstone managed to teach its rules under an hour without feeling like a boring info-dump. Then something odd happened, the game managed to fit itself into my daily routine. Normally at work if I'm not free for lunch around the same time as my co-workers, I eat my food while watching netflix on my laptop, but now that time was dedicated to sessions of Hearthstone. I'm not alone in enjoying this game so much, and its lengthy time as an unfinished product seems to have only benefited getting the word out. If anything, these crowdfunding campaigns, Steam Greenlight pages, and just playing unfinished titles is a far more enjoyable and less cynical form of marketing than I feel we regularly get from larger publishers. The interesting aspect of this whole crowdfunding, or crowdvoting in Greenlight's case, is that we've yet to see alot of it come to fruition yet. Most of the newsworthy titles are due to release next year as complete products, and judging by the success...we'll see if the trend grows or wilts. And you know what? I'm EXCITED to see what happens, more so than these new consoles, Steamboxes, or traditional game releases. I wanna know if a new channel of game distribution can open, because it benefits us all if it succeeds. So again, what are the games that surprised you, and what things did they do that you expect more of in 2014?